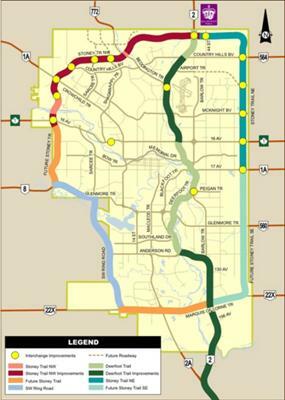 Why is there not a single map out there that shows the new Stony Trail in Calgary?? It's been open for some time but not one map or search engine shows it!! Barry's Response - It's just a test. They're not sure if they're going to keep the freeway where it now sits. First of all, it's spelled Stoney Trail. Your searches might work better if you try that. Having said here are a few examples right on the City's website. It runs across the north all the way east to the new Skyview Ranch suburb and then some. Yes I had been noticing the same thing in every map. In every map there is missing of this Stoney Trail Map. I searched the city website and I found the correct map. An update is needed.